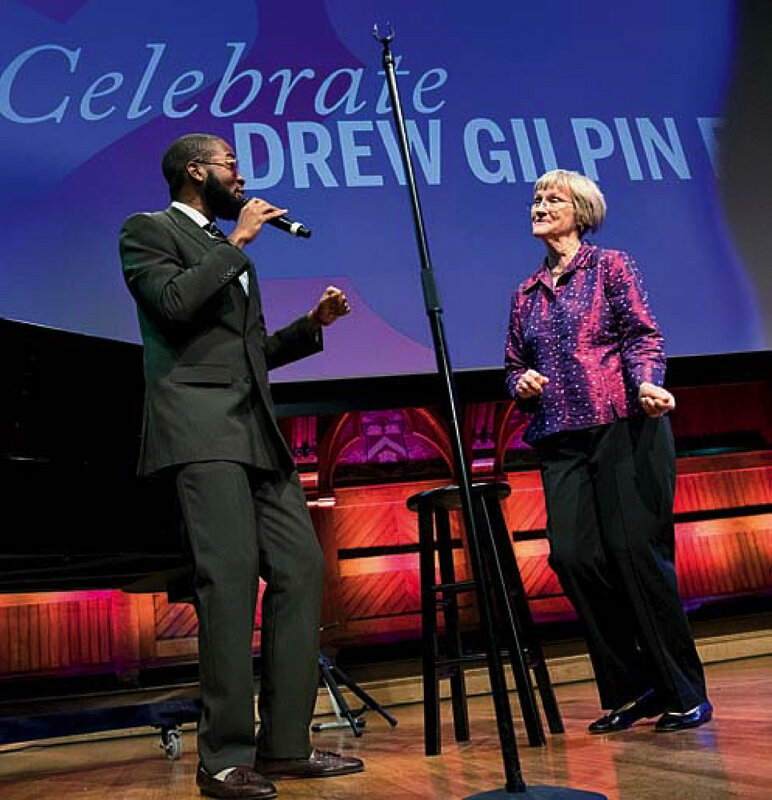 Joshuah Brian Campbell ’16 serenades a boogieing President Drew Faust at her pre-retirement party in Sanders Theatre. It looks brighter with tighter attire on. Still at Harvard, have I been misled? Matters less than what’s inside the head. Looking back to that exchange now, it was no contest. Laurans’s victory seems complete, to the delight and comfort of thousands of men, Byronic or otherwise. For as long as our country shall last. Given Harvard’s augmented international composition and reach, it is perhaps best that he was so broad-minded. The larger question, perhaps, is how long the current version of that troublesome last line (“Till the stars in the firmament die”) itself endures. Melting Moments. “Celebrate 28,” a by-invitation gala Drew Faust-fest thrown by the Corporation on the afternoon of June 28, lauded the concluding presidency with a concert/mock “report card”/graduation in Sanders Theatre (John Lithgow ’67, Ar.D. ’05, emceeing; trumpeter Wynton Marsalis, Ar.D. ’09, tooting his golden horn). It ended with Faust boogieing across the stage as Joshuah Brian Campbell ’16, reprising his 2016 and 2018 Commencement performances (as shown above), crooned “Ain’t Too Proud to Beg,” a twofer: an emotional opening for the fans in attendance (“I know you wanna leave me, But I refuse to let you go”); and a perhaps subliminal statement about a leader who did her utmost in asking (but not so much begging) to ensure the success of the $9-billion-plus Harvard Campaign. An evening of dancing in Memorial Hall ensued. The public exit reprised Faust’s first official day in office, July 2, 2007, when she held an ice-cream social in Harvard Yard. This one, on the steamy afternoon of June 29, took place at the Science Center Plaza, a tangible legacy of Faust’s community-building “Common Spaces” initiative. Sweet.